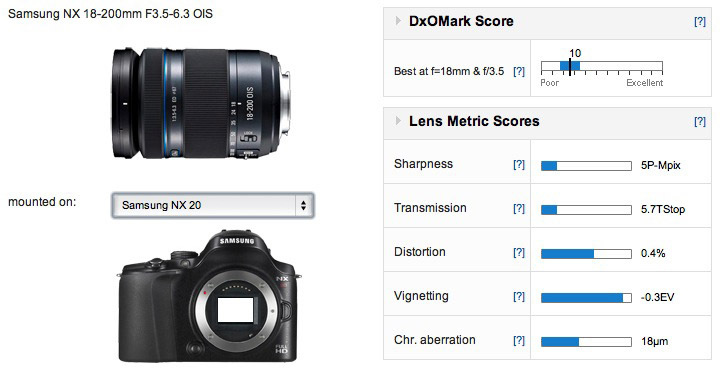 Samsung NX 18-200mm F3.5-6.3 ED OIS lens review: Pick of the range? Samsung makes a range of eight zoom lenses for the NX range of mirrorless with this one now being one of their earlier models. Although introduced during 2011 it has a number of current features including the firm’s innovative i-Function technology allowing the user to select a number of camera settings such as aperture values, shutter-speed, even ISO sensitivity, scene modes or exposure compensation via the lens’ manual focus collar using the dedicated button. The lens is also well equipped for video capture. In addition to optical stabilization, which can be used for both stills and movie clips, it has a linear type voice coil motor for smooth, near silent operation. Although not one of the firm’s premium S line models this lens has a high-grade optical system comprising of 18 elements in 13 groups including three aspherical lenses and two ED glass elements and focuses to a close 0.5m. At its longest focal length it has a useful 0.28x maximum magnification. With a 67mm filter thread, the Samsung NX 18-200mm F3.5-6.3 ED OIS measures approximately 2.83 x 4.15″ (7.2 x 10.55 cm), weighs 1.27 lb (578 g) and is available for around $679. 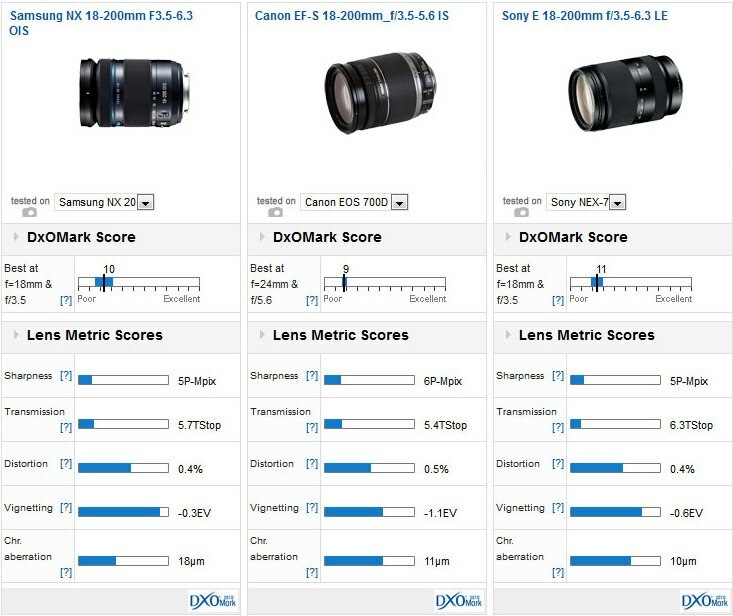 A DxOMark lens score of 10 points is typical for a zoom like this, as is the seemingly low-ish 5P-Mpix score for sharpness. 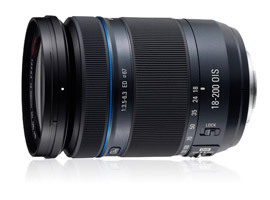 Keep in mind this is an averaged value; the imaging performance varies widely over the range of focal lengths. It’s not uncommon with high-ratio zooms but this model’s sharpness drops quite dramatically towards the longer-end of the zoom range. There are some other shortcomings as well. It has quite high levels of barrel distortion and higher than expected chromatic aberration, particularly at around 50mm, but also at 18 and 200mm. The scores are close when compared directly with rivals. The stabilized Canon is a good performer optically with a more uniform performance throughout its zoom range, although like the Samsung sharpness tapers off towards the longer focal lengths. The main difference is that the Canon maintains pleasing sharpness centrally. The Sony behaves similarly albeit with some loss of sharpness wide-open at the longer lengths. Both also exhibit lower-level limitations. The Canon has somewhat stronger distortion and that and the Sony have heavier vignetting, though both have better control of lateral aberration. The Samsung NX 18-200mm f3.5-6.3 is a well-specified lens but its optical quality isn’t quite a match for the newer models from rivals. It’s a very good performer at the shorter end of the zoom range but it’s far less convincing at the longer focal lengths. Sharpness is lacking from quite earlier on in the range and it’s especially noticeable wide-open. Couple that with higher than average chromatic aberration at those lengths and it’s likely to be disappointing unless stopped down which isn’t always practical with a zoom like this.